A controversial academic today risked to wrath of Britain's veterans and their families after calling the RAF airmen who bombed Nazi Germany war criminals. 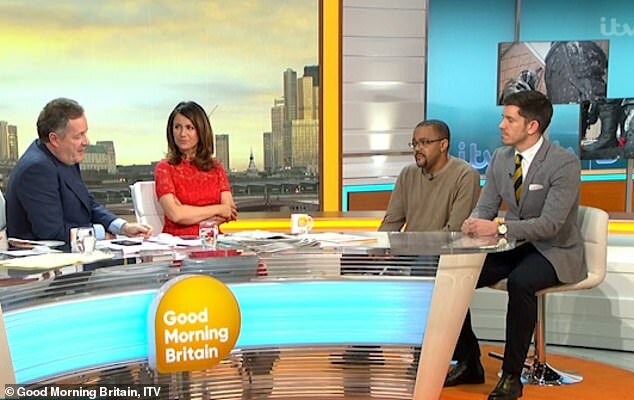 Dr Kehinde Andrews, a professor of black studies at Birmingham City University, said the decision to build tributes like the Bomber Command Memorial desecrated with white paint yesterday was like 'justifying terrorism'. 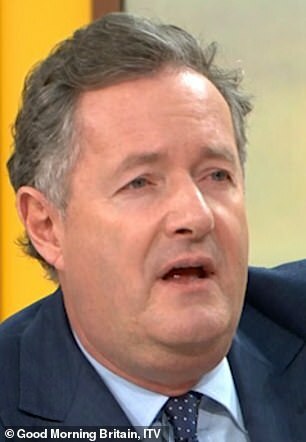 His extraordinary statements came on ITV's Good Morning Britain today where host Piers Morgan asked him: 'Why do you see everything that we are proud of as sticks to beat our country with? Sometimes you have to stand up and fight'. 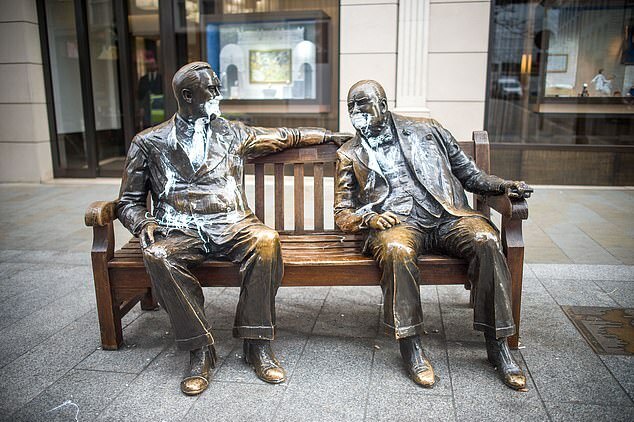 Police are still hunting for the gang who toured central London throwing white paint over multiple war memorials and a Winston Churchill statue during a 12-hour vandalism spree. 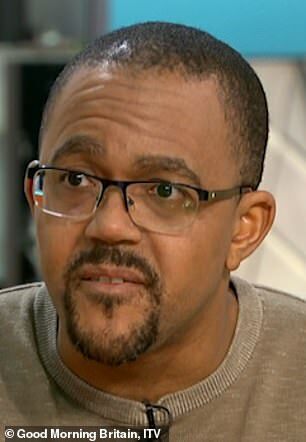 Who is Dr Kehinde Andrews and what has he said before? Dr Andrews is a professor of black studies in the school of social sciences at Birmingham City University. He has written books over the past five years including 'Back to Black: Retelling Black Radicalism for the 21st Century' and 'Resisting Racism: Race, Inequality and the Black Supplementary School Movement'. He has also written for publications on both sides of the Atlantic including the Guardian, Washington Post and New Statesman. Writing in the latter last week about Black History Month, he said: 'If schools want to genuinely engage with black history then they can embed it into their teaching. 'For example, rather than teaching the industrial revolution as a triumph of British engineering alone, teachers should link it to the enslavement and colonisation of Africa, which was essential to British history. And speaking about the wedding of Prince Harry to Meghan Markle in May, he said it was meaningless for Britain's black community in addressing racism in job prospects, the criminal justice system and health disparities. The Bomber Command Memorial in Green Park, built to remember the 55,573 airmen who never came home during the Second World War, has been damaged for the fourth time since the Queen opened it in 2012. The attacks have caused great anger and grief to veterans and the families of those who lost their lives. Dr Andrews, who believes Britain was 'built on racism', said today: ‘I’m not defending the vandalism of memorials at all. What I’m saying is the way we put up these memorials is the wrong way. ‘It’s a tragedy, and those lives lost were also a tragedy. But the majority of those bombers were going to civilian targets – over half a million German civilians, men and women, were killed. This was a war crime'. He added: 'In that story we forget the 500,000 people who died. We don’t hear about the killing of civilians, which was a war crime'. Dr Andrews then shot back: ‘Why is your version of Britishness so shallow? So we are justifying the killing of thousands of women and children, because there you’re justifying a war crime'. The academic, a professor of black studies at Birmingham City University, also compared Britain's war-time Prime Minister to Nazi leader Adolf Hitler for his treatment of Indians when the country endured a famine in 1943. Dr Andrews has also said that British imperialism had 'ruined' many other parts of the world, including the Caribbean and Africa. 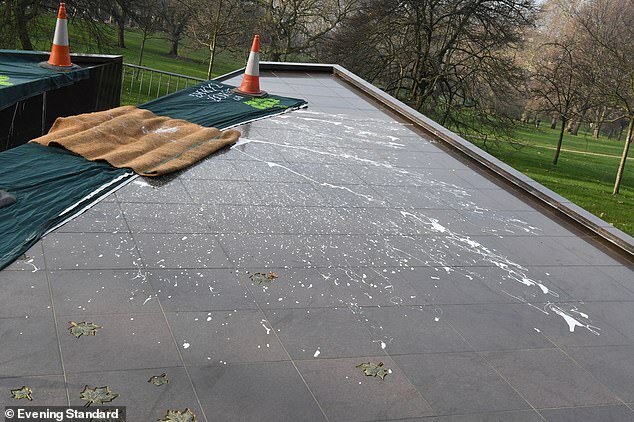 Vandals who targeted a string of war memorials in London were condemned as ‘despicable’ by veterans yesterday. Three memorials and a statue of Sir Winston Churchill were damaged in a series of attacks on Sunday. 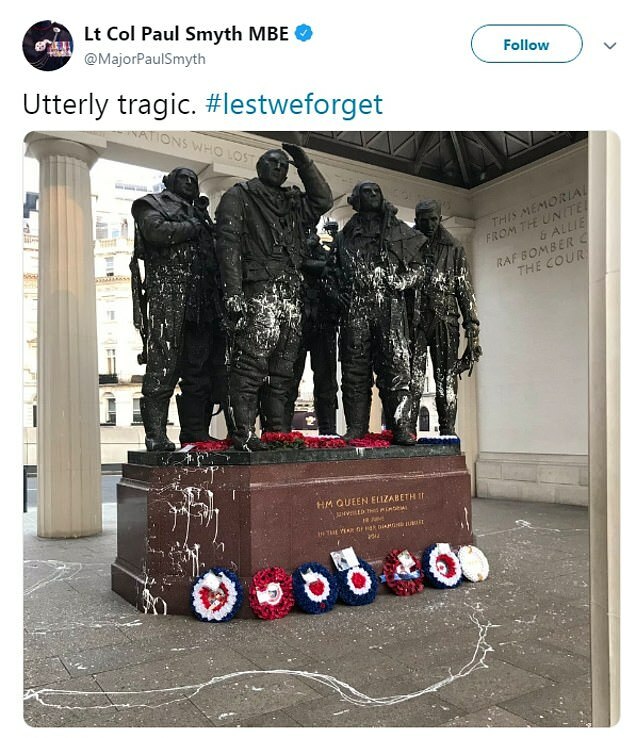 White gloss paint was daubed over the Bomber Command Memorial in Green Park, which features bronze sculptures of airmen representing the 55,573 who died in the Second World War. It was the fourth time it has been targeted since it was unveiled by the Queen in 2012. Police suspect the same vandals attacked a plinth remembering Royal Marines and a memorial for Canadian forces. A statue of Churchill sitting on a bench with President Franklin D Roosevelt was also damaged. Mr Murray said the ‘despicable act’ took only moments but would take time and thousands of pounds to put right. But he said there was ‘no way’ a fence would be put round the memorial, which serves as a symbol of freedom. 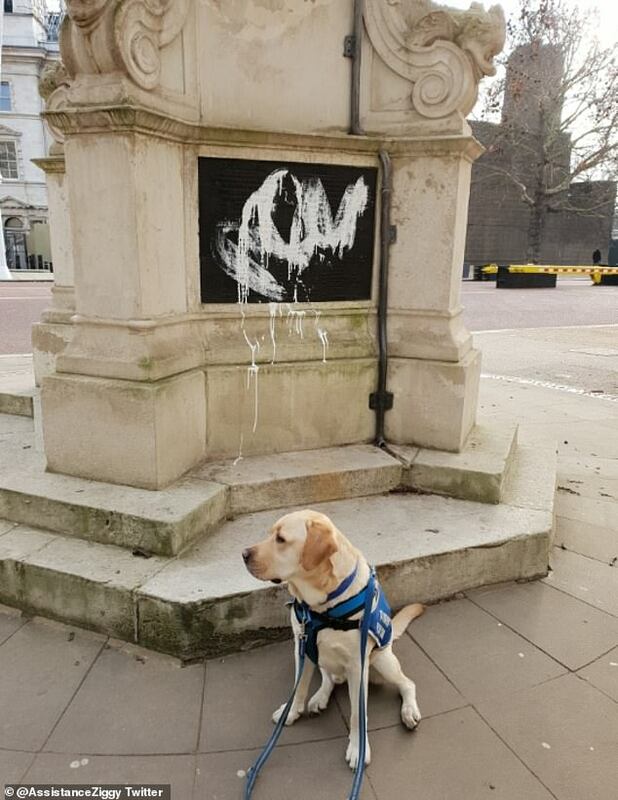 White paint was also smeared on the 1903 Royal Marines memorial which commemorates men who died in the Boxer Rebellion in China and the Second Boer War in South Africa. Police inquiries are continuing and no arrests have been made.